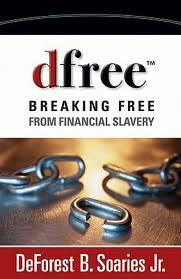 Drawing on his years of experience as a pastor, public policy maker, and community leader, DeForest ‘Buster’ Soaries, Jr. shares the four vital keys to debt-free living in this groundbreaking, life-changing new approach. Here, Soaries shares the four vital keys to debt-free living that have helped hundreds of families in his church get out of debt. By replacing the ‘get more money’ mentality with a ‘get out of debt’ approach to financial freedom, not only were hundreds of people able to go debt free, his church’s offerings increased by $1 million dollars–during the recession. Soaries earned degrees from Fordham University (BA), Princeton Theological Seminary (MDiv) and United Theological Seminary (DMin). He lives in New Jersey with his wife, Donna, and twin sons, Malcolm and Martin.